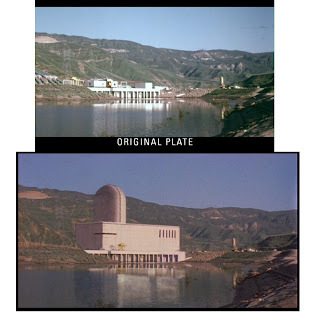 Today's blog will be a retrospective look at the many photographic, matte and miniature effects featured in the big 1955 20th Century Fox epic THE RAINS OF RANCHIPUR... but first, some updates on what's happening in NZPete's world of trick shots. 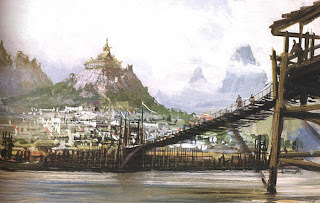 Future blogs will be a Disney Double which will look back at two of the biggest effects movies produced by the Disney Studios - IN SEARCH OF THE CASTAWAYS (1962) and ISLAND AT THE TOP OF THE WORLD (1974). 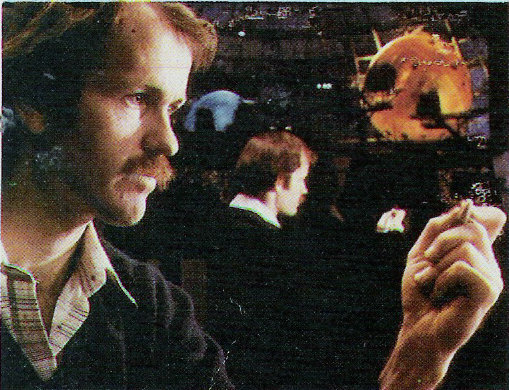 Former Disney matte artist and visual effects supervisor Harrison Ellenshaw has graciously agreed to tell us all about these two huge films, and I know alot of people out there have a fondness for both films, so all things going well, next 'issue' it'll be Disney on a grand scale. As if that weren't enough, I'll be featuring a vast and comprehensive career piece on Harrison and his many, many films in a significant interview where we'll be discussing many and varied aspects to Harrison's chosen career such as the 'Royal Lineage' of Pop Day and Harrison's dad Peter, through to working with visionary film makers such as Nicholas Roeg, George Lucas and others. Harrison's a great guy to talk to and has alot of wonderful stories to tell. Stay tuned. I have a retrospective on the action packed war film TOBRUK (1967) due soon too. Lots of terrific Oscar nominated Albert Whitlock shots and thrilling Howard Anderson miniature battles. Solid stuff, all of it. I just cannot understand how this show lost out to that awful DOCTOR DOOLITTLE in the effects stakes!! Lastly, I've come across some rarely seen material on the late and enormously talented British special effects man Wally Veevers, and this too will form the basis for a one off article on his life and achievements. I was most pleased with the response to my last article, Matthew Yuricich's Oral History, and I thank all of those who have commented and written to me on Matt. As is often the case with these things, a sort of Murphy's Law as it were, important tidbits, photos and historic fact sometimes comes to hand after I've published these mammoth blogs - and this is the case with my Yuricich article. Federico: "I think the 'real artist' Yuricich made reference was Neil McGuire. I've attached to this mail a page from the Motion Picture Studio Directory and Trade Annual 1921 (Published by MOTION PICTURE NEWS, INC., 729.7th Avenue, New York) related to Newcombe and McGuire's art effects company. 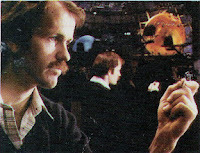 From the same source, the brief profile of Neil:"
McGUIRE, Neil Elwood, art director; b. Santa Maria, Calif.; educ. Univ.of Calif, and Art Students League; screen career, Universal, Triangle, Thos. H. Ince, art title director, Famous Players, Selznick, recent productions: "Passion," "Inside of the Cup," "Vendetta." 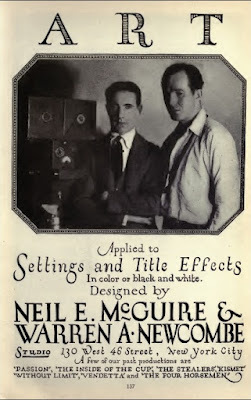 Neil Elwood McGuire was born in Santa Maria, California, on October 17, 1896. He died there on January 8, 1972. In 1942 he was employed at Fine Arts Studios, Santa Monica Boulevard, Hollywood. Neil McGuire, special effects technician who started his film career during silent pix, died in Santa Maria, Calif., Jan. 8, it was learned over weekend. He had made his home there, where he was reared, since retirement in 1965. McGuire was with Universal early in career, later also active in tv. He produced a number of educational films, including "Lincoln's Gettysburg Address." He specialized in scenic effects and miniatures. 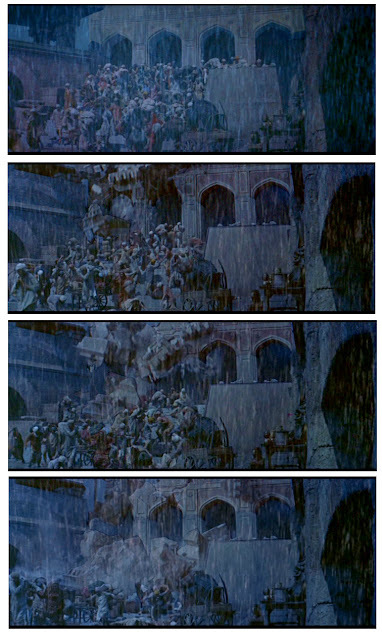 I'm most grateful to Federico for this information (and numerous other past discoveries) on a pioneer in the matte art field whom I'd never heard of. I never suspected this as a matte, till now! 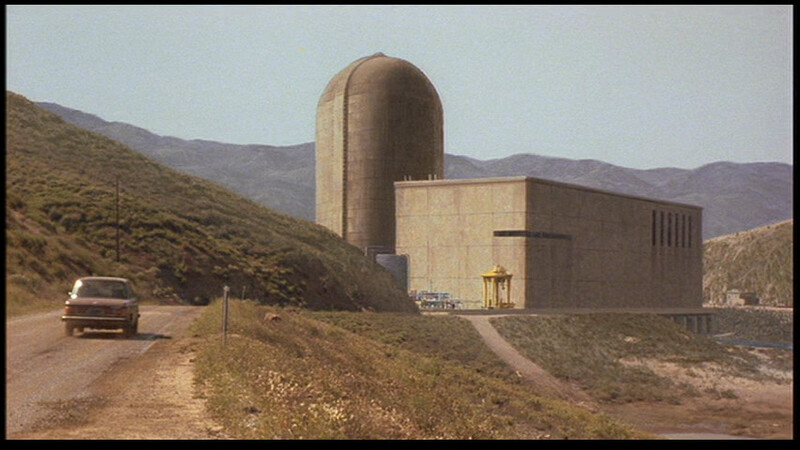 While on Matthew's blog, I will take this opportunity if I may to illustrate a few of Matt's outstanding, invisible matte shots he made for the excellent nuclear thriller THE CHINA SYNDROME (1978). All I had on file till now were lousy VHS images as I'd never been able to track down the DVD - until now! It's far too tricky an affair to go back into those big blogs to 'fix' things without the damned thing falling apart - possibly due to the sheer size of my blogs, so here are those wonderful mattes which Matthew spoke of. Incidentally, the blogger stability issue really came to a head recently while I was looking back at a few old articles and to my utter horror discovered about two thirds of my BIG War Film Special Effects article had simply disappeared without trace!!! I spent a lot of time putting that together a few years ago, so naturally I'm very bloody annoyed. I'll try to resurrect as much of it as I can remember, which ain't easy as it's not as though it's a one off 'click', but more like uploading the hundred or so frames all over again and adding text. Anyway, here are those CHINA SYNDROME mattes in all their glory..... Enjoy! Matt had artistic and compositional issues on this production with photographic effects man James Liles, but the finished mattes are really first class and are always utterly convincing. Al Whitlock often remarked: "The true special effect is the one that nobody ever notices". That credo is flawlessly observed here in what is a major trick shot with almost everything added by Matthew's brush. 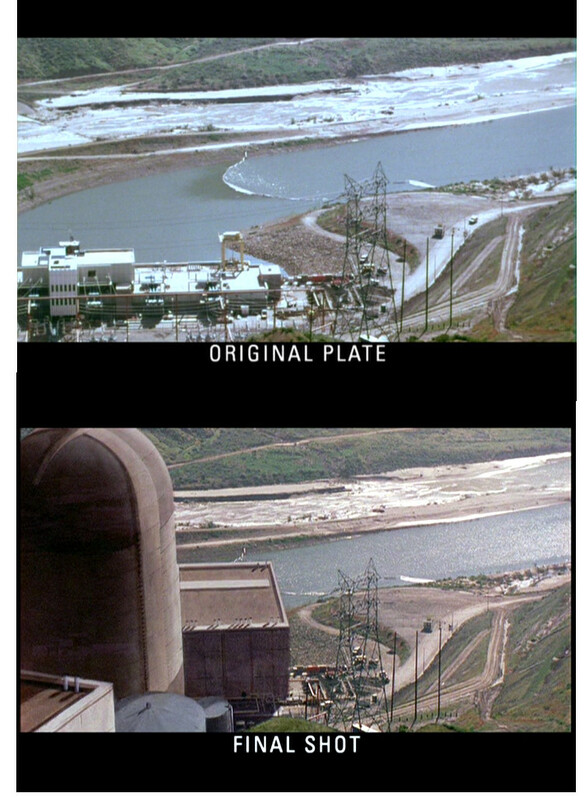 A great before and after for the fictional nuclear power plant. Now, I'd never noticed this invisible matte until a few days ago. Matthew wasn't happy with his work on this shot and was self critical of his perspective drawing for the cooling towers. 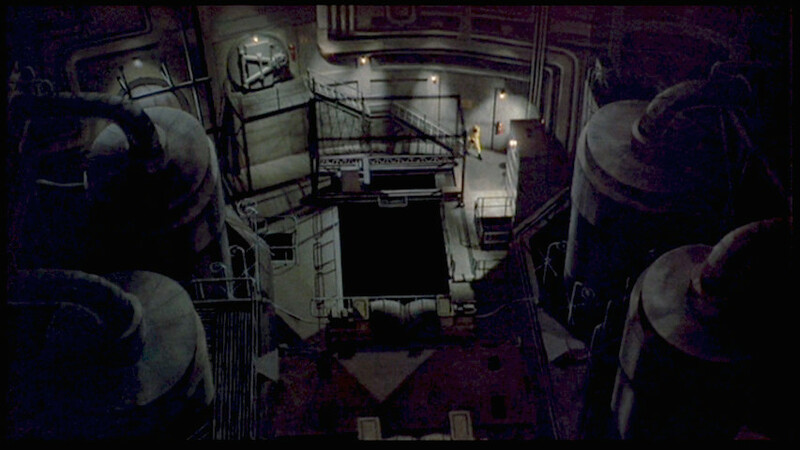 The entire shot is painted except the stairs that Jack Lemmon walks down. Jim Liles intoduced an optical zoom in and back out with the painting remaining on screen for a relatively long duration. 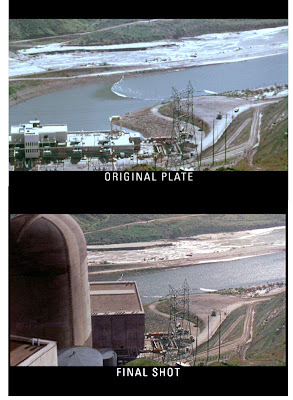 I've always been a sucker for the disaster picture, and not just the ones we all remember from the so called disaster cycle of the 1970's. A great many more cropped up in early times, and I've discussed many of those here in past blog articles such as IN OLD CHICAGO, THE RAIN'S CAME and others. 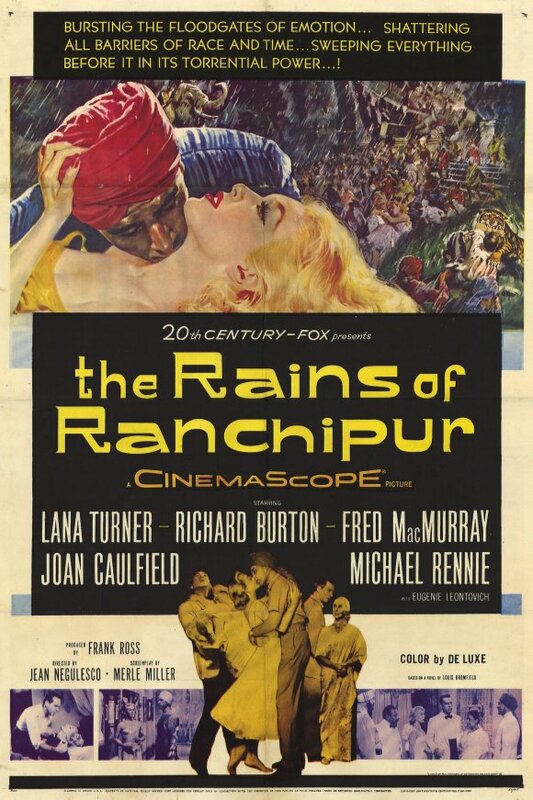 THE RAINS OF RANCHIPUR (1955) was in effect a near shot for shot remake of Fox's earlier, and better Tyrone Power show THE RAINS CAME (1939). My earlier article on that film may be found here. 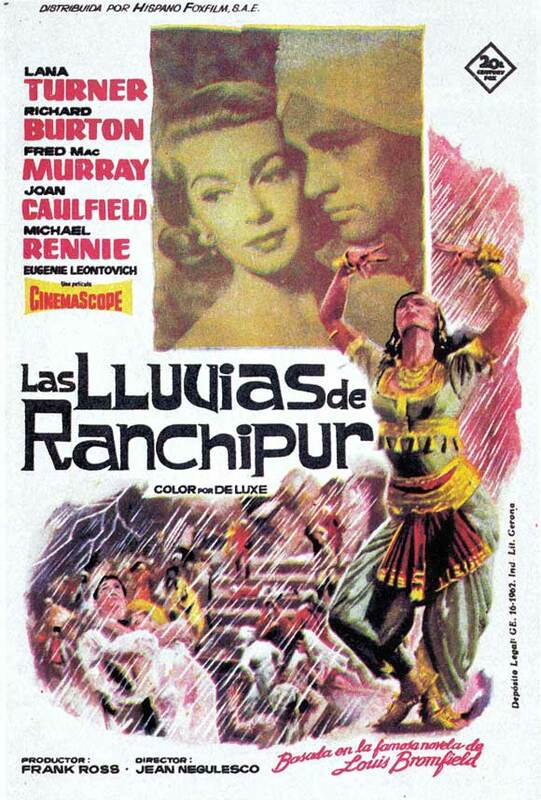 A glossy, big budgeted CinemaScope love story featuring Lana Turner and a badly miscast turbaned Richard Burton, set (and partly shot, by the looks of it) in India, the picture is punctuated by an earthquake and a colossal flood, much of which looks pretty good still today. The picture was a 1955 Oscar nominee for it's photographic effects, which were supervised by 20th Century Fox veteran effects man and matte artist Ray Kellogg. 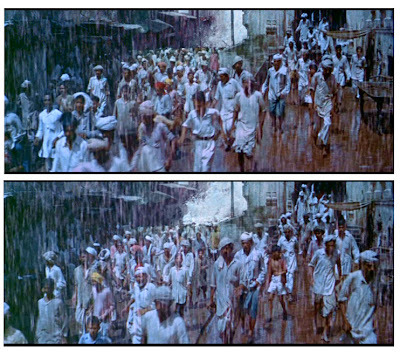 Interestingly, the earlier film THE RAINS CAME did win the Academy Award for special effects - and deservedly so. This remake has several good painted mattes, excellent miniatures and impressively well scaled deluge shots must have looked sensational back in the day on the huge Scope screen. The many optical combination shots suffer as one would expect from the anamorphic lens format and travelling matte shortcomings of the period. Until recently I'd only ever seen Ranchipur on tv in awful cropped down pan & scan format, though come to think of it, I actually don't even think it was scanned at all - just dead centre with much periphery action just not seen and Lana's nose at screen left and Burton's nose at screen right in dialogue scenes. Jesus! I still love the old Scope logo and fanfare. It really meant something as a kid at the movie house to see this! The opening matte painted shot - a sprawling vista of Ranchipur, India. 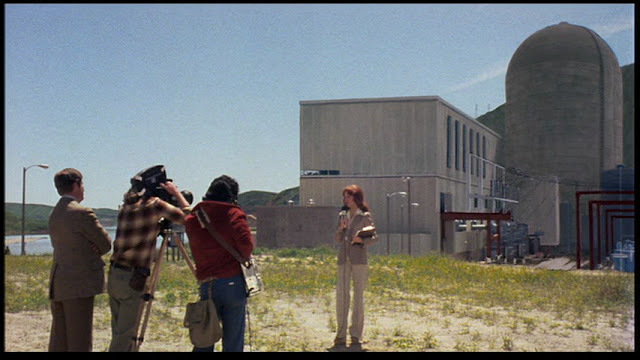 I'm not sure if this is a matte or a genuine location shot? A stunning matte which may have been achieved by painting over a large photo enlargement, as was common at Fox. Painted Indian fortress matted in. The quake begins. Exceptional integration of miniature collapsing building with live action and possible painted left side of the street. This is the sort of shot set up that the Fox FX dept were well versed at over the years. 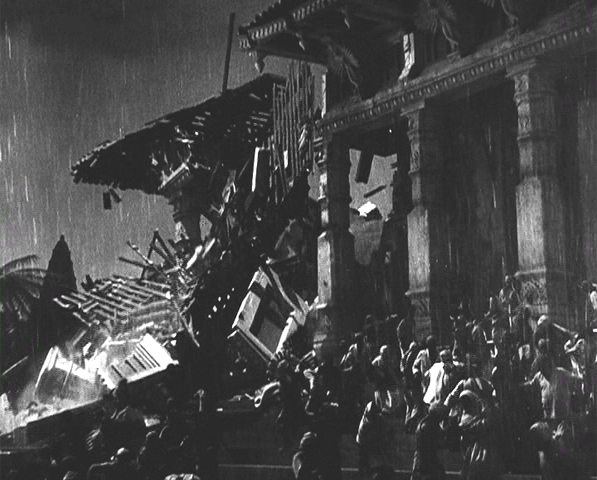 The next shot in the sequence where tons of miniature rubble and architecture falls onto fleeing Indians. An excellent and well assembled travelling matte with presumably a significant hand drawn rotoscoped aspect involved. 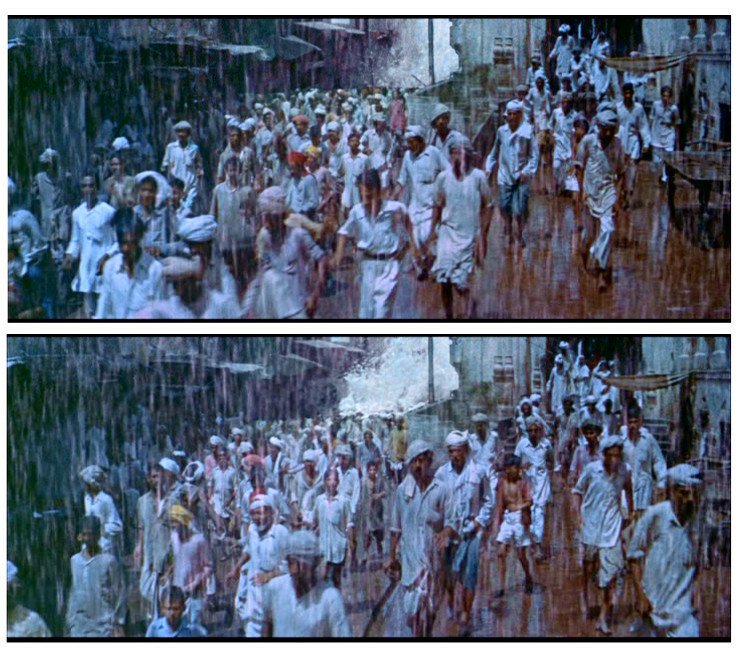 Some frames from the original RAINS CAME for comparison. Extras and miniature collapse all beautifully tied together by travelling mattes which being in black & white help conceal technical issues better. One of the few 'hokey' shots. Extras atop of matte painted gash in earth, with left and right action separated by a very visible split screen whereby both sides 'shake' up and down optically. 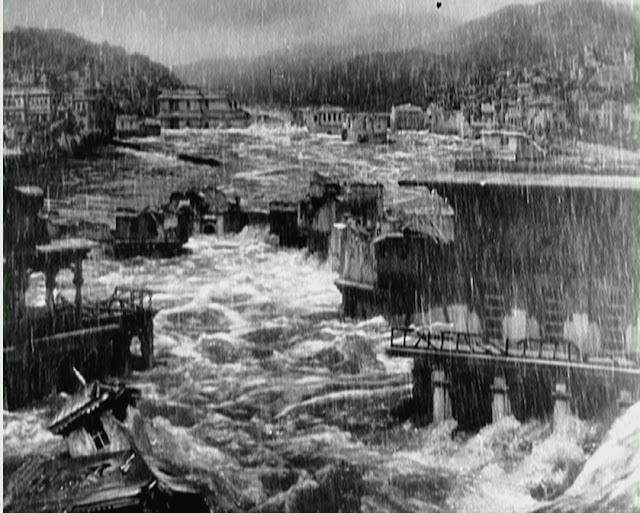 Quite poor when compared with the same scene in the 1939 film (see below) which was a mind blower of an effects shot. 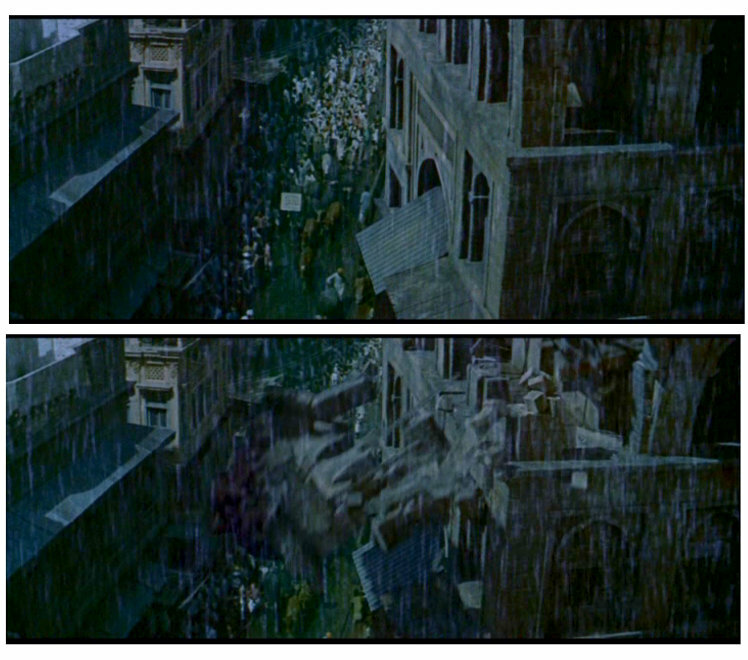 The same action as depicted in the earlier film, where the earth suddenly drops away with crowds of people falling into the abyss. To this day this effect blows me away with it's violent ferocity and flawless execution, which I'm still not sure how Fred Sersen pulled it off so effectively? And the rain keeps falling............... A wonderful painted matte shot augmented with rain overlay. "I canny hold her together anymore Captain...she's breaking up"
The same footage as it appeared in other Fox shows, such as one of the James Coburn FLINT movies for memory and maybe even some Irwin Allen tv shows. The rains came, and came, and came! Good miniature work and 'scaled water'. Having the disasters occur at night helps to lend a more realistic look to the shots and darkness can hide a multitude of sins, or so I'm told! Live action/miniature travelling matte combo. The people all seem so unconcerned though. 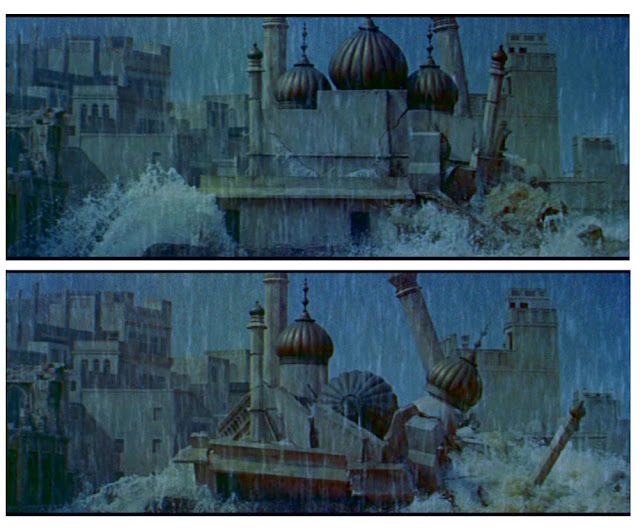 Same event in the 1939 film. One of the greatest shock effects of all time, and one executed with such skill as to be utterly convincing and terrifying in the same instance. I'm not sure how Sersen did this, but would bet this was an entirely miniature set with the people matted in very believably and then removed with an articulated hand drawn matte as the water envelopes them? One jaw dropping special effect. I've lightened up this frame to better see the construction of the very elaborate and realistic composite of elements. 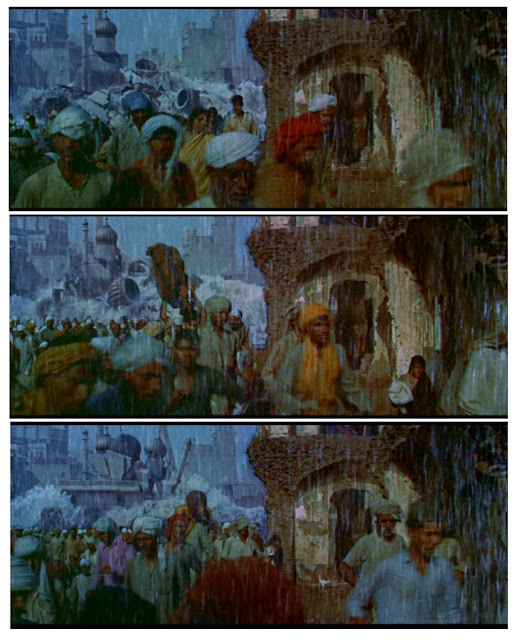 I think the water and the street are two separate elements filmed at different times and beautifully combined on the optical printer, with the people at right yet another element, split screened in. The whole sequence may be seen below. The raging floodwaters in action. The best effects shot in the film with a very high standard of compositing. The same set piece in the 1939 film, with miniatures, matte art and live action all flawlessly combined, and the well earned winning Oscar special effects picture that year. Most of the RANCHIPUR effects people worked on RAINS CAME too such as Ray Kellogg, James B.Gordon, Bill Abbott and Menrad von Muldorfer. The hazards of the travelling matte process in the fifties, especially on CinemaScope shows where film element shrinkage is exacerbated by the stretched anamorphic process which magnifies matte lines on the left and right thirds of the widescreen. 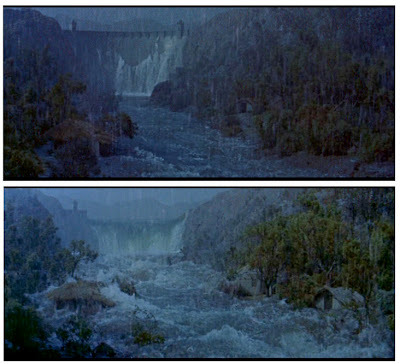 Still, this is as good if not better than the almost identical FX shots done some 24 years later for the huge $20 million epic METEOR (1979) which is infamous for having the all time worst photographic effects ever!!! Again, I've lightened up this frame to better demonstrate the miniatures and badly washed out (no pun intended!) travelling mattes. Another good multi part effect which I would suggest is largely a miniature set with dump tank deluge, live action people matted in and I'm sure the upper part is a painted matte to extend the set. The reverse angle on the same sequence, which I've lightened up a little so as to see the components of the shot. Aside from some peculiar transparency on the upper people and the highly evident TM lines against white water this actually looks pretty good on screen in motion. Another view which really works well. 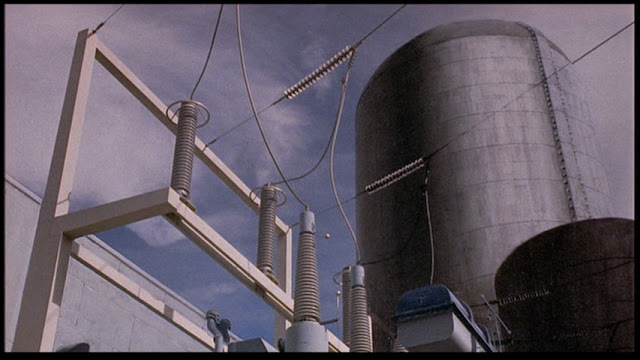 What I like about these shots is that the Fox effects guys must have used every inch available of the Sersen tank to obtain such well scaled water effects - not an easy task by any stretch. 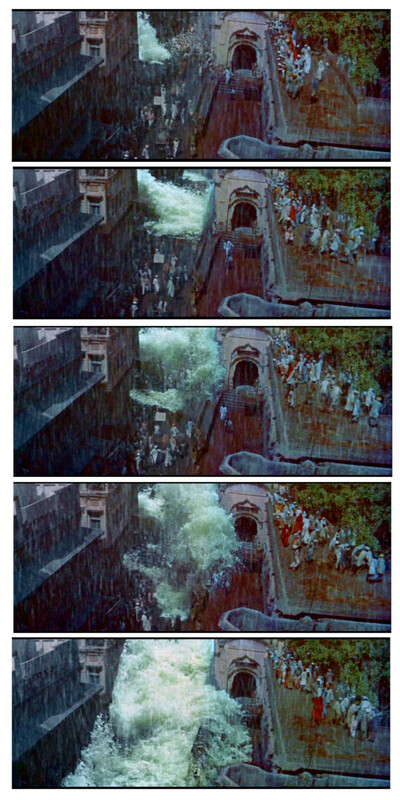 The 'physics' and weight of the water, not to mention the foam and spray in these FX composites really is superb and among the best of it's type. L.B Abbott would eventually make a name for himself on many shows for his tank shots. I always felt he deserved the Oscar for 1941.... but don't get me started on bloody Oscar injustices at this time of the day! The bridge gets hit. Miniature bridge and dump tanks, and I'm just guessing here, but maybe mechanised toy people 'running' to safety? If it were an MGM film I just know that Arnold Gillespie would have done it that way. 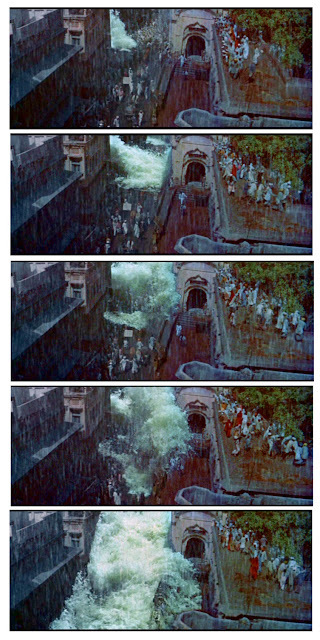 The sequence looks exciting here but once again, the Sersen variation of it for the original film is better (see below). 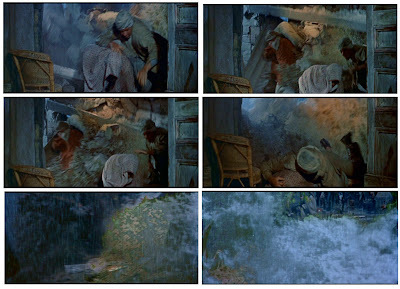 The sequence as seen in THE RAINS CAME (1939) with the added realism factor of real people carefully matted into some shots, and on other angles having miniature water matted onto the people with articulated mattes. Extras swept away with TM water. Probably not such a good idea. Dump tanks on stuntmen would have worked better. 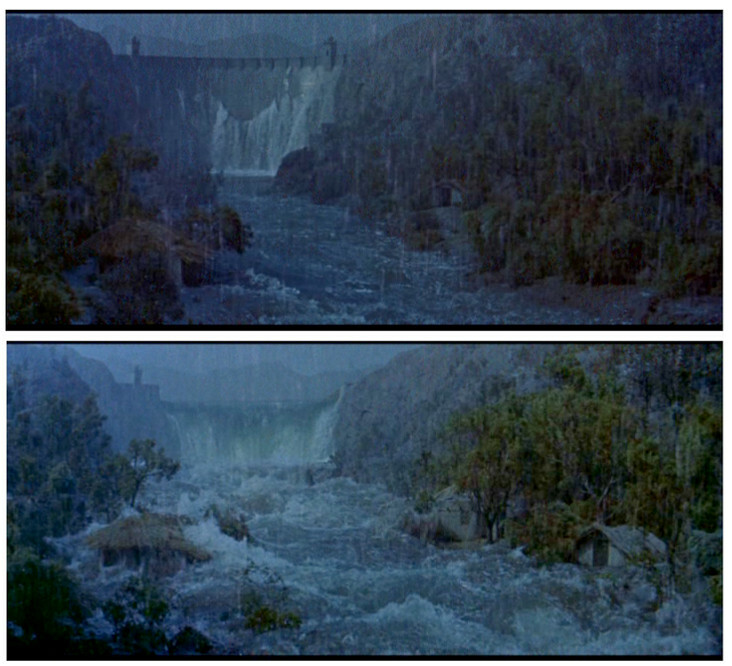 The floodwaters recede.... a glorious matte painting. The people return to Ranchipur. A mostly painted matte shot with some perspective irregularities. A full screen painting with just a small slot with the car driving off into the distance.